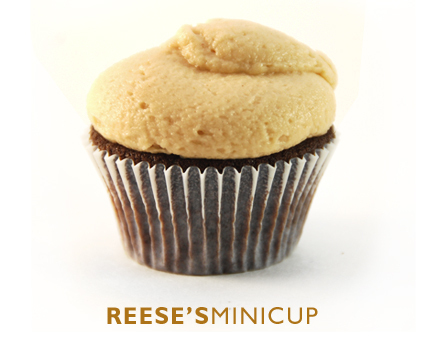 If you like Reese’s Peanut Butter Cups as much as I do, you’ll definitely want to try this irresistable cupcake combination. It uses the same rich chocolate fudge cake recipe as I used for the Oreo Cookie Cupcakes. Get the recipe here. I topped these with a light creamy peanut butter buttercream frosting, and piped them full with a surprise filling that is thick and creamy just like a Reese’s Peanut Butter Cup. Both filling and frosting were do delicious, we couldn’t stop eating and licking our fingers as we made these. We literally piped piles onto our fingers and ate it straight. Peanut butter lovers beware! The whipping cream and abundant powdered sugar keep this frosting light and fluffy. Beat the butter and peanut butter together in a mixer until light and fluffy. Add the vanilla, salt, and powdered sugar until smoothly blended. Starting on low speed, slowly add the whipping cream until mixed in. Turn the mixer to medium-high for 2-3 minutes until it gets light and fluffy. There is much less sugar and dairy in this filling recipe, leaving it heavier than the frosting but too thick or oily from the peanut butter. Once the cupcakes have cooled, they often settle with concave centers. You can pipe the filling right on top of the cupcake to fill the depression or you can inject the cupcake using a piping bag and a plain round tip. Pile the buttercream frosting on top has high as your heart’s content.